When I have a chance to meet with the parents of the pre-k kids in my classroom, I try to fill the time with non-stop information. My goal is never to be overwhelming, but to find ways to encourage meaningful play and learning at home to! 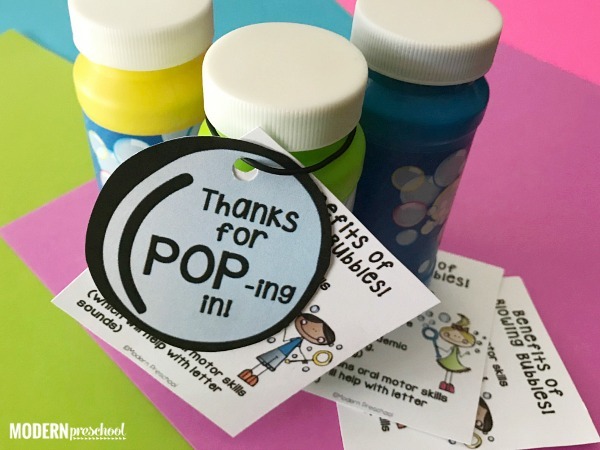 Last year, at our open house parent meeting (similar to a curriculum night at the big kids’ school), I gave out our “Thanks for POP-ing in!” bubbles with a printable tag that included why bubbles are more than just for fun. The free bubbles printable includes 6 bubbles and 6 bubbles cards with 5 benefits of bubbles for little kids on it. Print out the file from the pink button below. Cut apart the bubbles cards on the gray dotted lines. Cut around each bubble on the thick black outline. 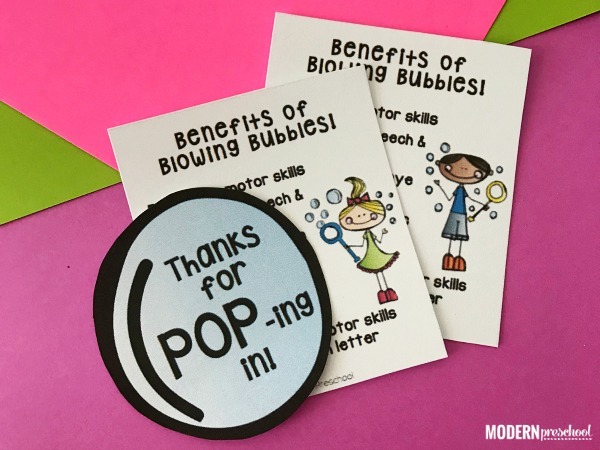 To put the open house bubbles “Thanks for POP-ing in!” printable together, simple use a hole punch to add a hole to the bubble and the bubble card. I punched a hole in the top middle of the bubble and the top left corner of the bubble card. 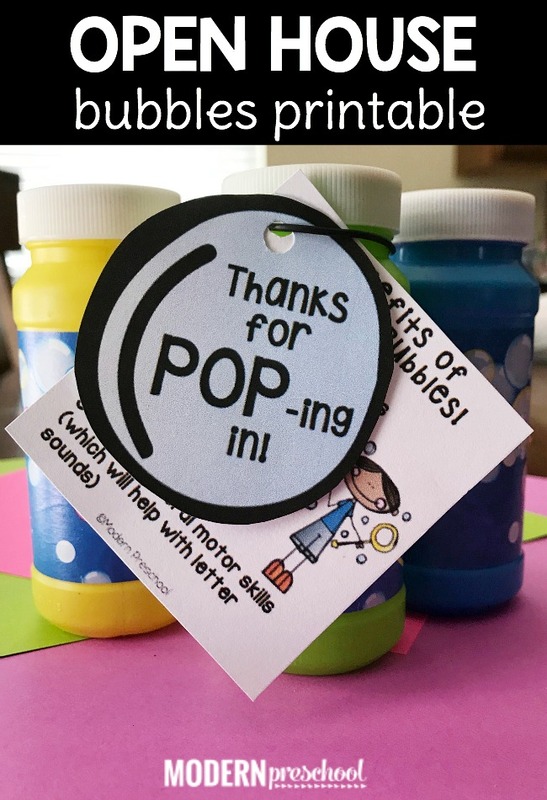 Using bubble containers that I bought at the dollar store, I used string to attach the printables to the bubbles. Easy peasy! It takes no time to put together these parent and student gifts for open house in your preschool, pre-k, or kindergarten classroom! I know some teachers give little gifts at meet the teacher or orientation. This may be a fun time to give out the bubbles. I also know that there were more than one of my pre-k kids last year who had never blown bubbles before being in my classroom. So don’t assume that bubbles are old news and no fun. Bubble never get old! And this a great non-food version of many of the go-to student gifts given towards the beginning of the new school year. I have also handed out a popcorn version full of learning activities to go along with snacking on popcorn! My younger classes loved these, but I do feel like they can be used with 3-6 year-olds depending on learning levels. No matter which printable you decide on (or maybe give out both! ), the parents will appreciate the tips and ideas! Download the bubbles printable now! Excited about the bubbles printable? Well, there is even more! I’ve created a MUST-HAVE back to school pack that includes SO MANY printables for your preschool or kindergarten class! Some of the printables are editable to save you valuable time and energy. Preschool, pre-k, and kindergarten, as well as boy and girl options are included in this printable set. 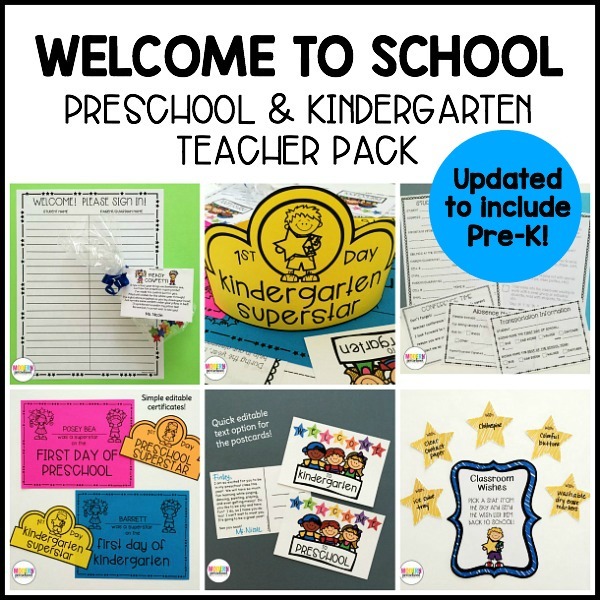 Grab the Welcome to School Pack for your class!